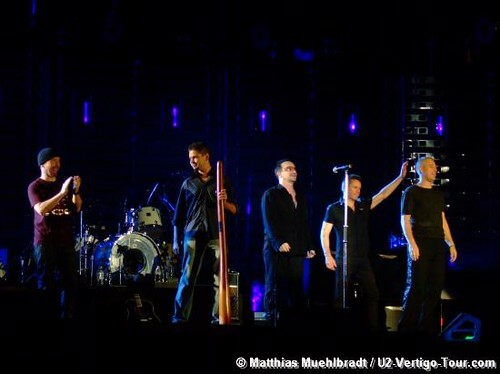 U2 and didgeridoo player on stage in Brisbane at the end of their set. “The line up process was well organised with a first in best dressed policy (no fan club priority) . I got there just before midday and secured a position right on the railings of the stage (Adam’s side) The show seemed pretty much the same as what had been done previously but with a few changes here and there. ‘Walk On’ was performed as a full band again, and it showed that it had been a while. It seemed to take a the first verse or so for the band to get it right. 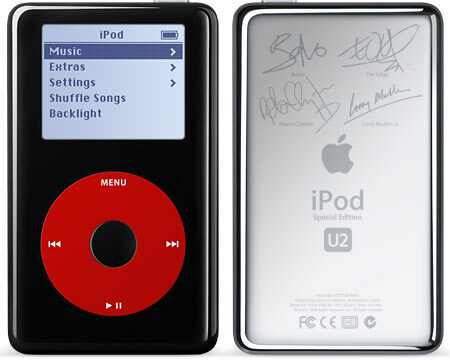 A special 20GB black U2 iPod that will retail for $349US featuring all four band members’ signatures. A digital box set of all of U2’s albums as well as over 25 rare and unreleased tracks. The box set will retail for $149US. U2.com says that those tracks will include material from Hasta La Vista, Baby! and Melon, the Propaganda-only fan club CDs. The total is said to be “over 400 tracks” — which is a lot more than just all the albums. Hopefully there’ll be more on this soon. A iPod Photo for sharing your iPhoto library with friends and family who aren’t already sick of your photos. Price: $499US (40GB); $599US (60GB). Update:Watch the video stream of the event.